Australian Town and Country introduces "The Dawn"
The Australian Town and Country Journal was published in Sydney by Frank and Christopher Bennett between 1870 and 1919. On 2 June, 1888 it published the following introductory announcement in a section titled "Our Bookshelf." This is the name of a new monthly periodical published in Sydney, and purporting to be written by women for women. In other words it is, according to the prefatory notice, "The Australian woman's journal and mouthpiece." Dora Falconer is the editor, and Louisa Lawson the publisher. The paper is well and clearly printed, and contains a good deal of miscellaneous information and original articles whioh ought to recommend it to the favorable notice of its fair readers. "... no sign of falling off in interest or utility. The contents include several chatty articles, hints on gardening, notes on cookery and other matters domestic, poems, stories, and some admirable "competitive paragraphs" on various subjects. 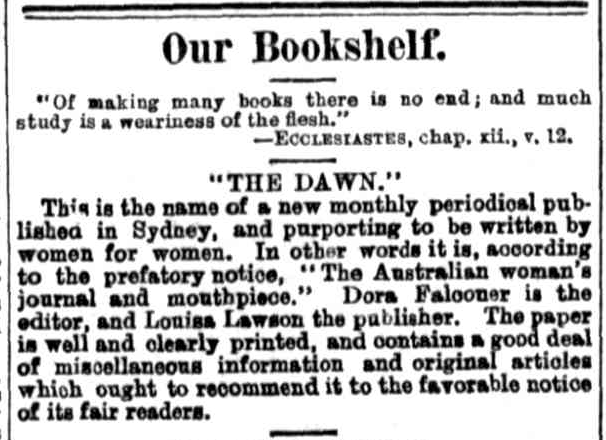 The current number of the "Dawn" reaches us from Mrs. Louisa Lawson, and contains useful articles on fancy work, gardening, and fashions; has a number of good cookery recipes, stories, prize competitions, poems, news of women's work, ¡etc., and in all respects keeps up its high standard as an interesting and informing journal for tbe household. The latest number of the "Dawn" has been received from Mrs. Louisa Lawson, and contains interesting and useful articles on dress, cookery, and domestic economy generally, as well as stories, poems, and children's corner, and news of women's work in all parts of the world.